Why Do the Dutch Swim so Fast? In the last 18 years several Dutch swimmers have done extremely well for such a small country. The Dutch swim team gathered some medals at the Atlanta Olympics. At the 1998 World Championships in Perth they won some more medals including gold as several swimmers made the finals. At the 1999 European championships most of the press reports were on Pieter van den Hoogenband but the Dutch men's swim team broke the European record in the 4 x 100 m free relay. While everybody in the swimming world became aware of Pieter van den Hoogenband and Inge de Bruijn, many of their team mates have also been doing well. At the Sydney Olympics both the Dutch men and women's teams won relay medals, a first for the Dutch swimmers at the Olympics. Pieter van den Hoogenband broke the world records for the 100m and 200 m freestyle. He held the 100 m record for 8 years. In the 2001 World Championships in Fukuoka, the Dutch men's 400 m freestyle relay swam the 4th fastest relay of all time at that time. In Athens this relay finished second ahead of the US team and behind the South Africans. Also in Athens the women's 400 m freestyle relay won bronze. In 2008 the women's 400 m freestyle relay won the gold medal and then won the silver medal in London in 2012. In 2009 they broke the world record and still hold it as of 2012. At the London Olympics Ranomi Kromowidjojo broke the Olympic records in the 50 m and 100 m freestyle. Marleen Veldhuis won the bronze medal in the 50 m freestyle at the London Olympics and she is currently the world record holder in the 50 m freestyle in short course. Marleen has been the 50 m freestyle and butterfly world record holder in long course. In the World Short Course Championships at Doha on Dec 3-7, 2014 the Dutch won 12 medals, including 5 gold and breaking 4 world records. The only other country with more medals was the United States with 17. And it is not just sprinting that the athletes Jan advise excel in. In 2008 Maarten van der Weijden won the Olympic gold medal in the 10 k swim in Beijing. And for 14 years Luc van Lierde held the Ironman world record. Jan has advised several other top level triathletes including the Ironman World Champion of 2013, Frederik van Lierde. For comments on how Jan Olbrecht has played a role in this success see the comments below. Dr. Ernest W. Maglischo - Successful coach and author of "Swimming Fastest" . Jacco Verhaeren - Coach of Pieter van den Hoogenband, Inge de Bruijn, Marleen Veldhuis and Ranomi Kromowidjojo at PSV Eindhoven* Now the Head Coach of Australian Swimming. *Inge De Bruijn did most of her training in the US under Paul Bergen. However, she competed frequently with the PSV Eindhoven team. 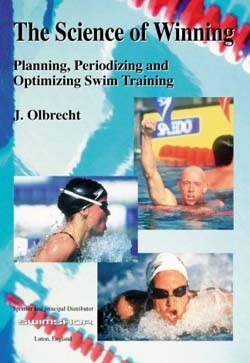 It's very rare that a book can mean so much for the professional training of athletes; Prof. Dr. Jan Olbrecht's book does! - He has a Ph. D. in physiology and biomechanics and is training adviser to numerous world class athletes - His method is based upon careful planning and a unique method of lactate testing to assess and optimize the athlete's conditioning and potential - His book should be considered as a manual for the modern coach who wants to know before planning and periodizing what kind of conditioning adaptations to expect - It provides knowledge and shares experience in a very understandable way and is applicable to every training situation - It advances some new important concepts, most notably that training at anaerobic threshold speeds is not the most effective way to improve aerobic endurance and that aerobic and anaerobic metabolism must be developed to optimum levels, not maximum, in order to perform well in competition. "All right. Let’s talk about capacity, what that means. The other part that went with this is I read a great book. I did a clinic in Canada, a guy named Jan Olbrecht. He had written a book called, “The Science of Winning.” And man is it a dense in terms of information book. I think I’ve read it eight times I almost understand it. But he talks a lot about some general training categories...aerobic endurance and aerobic power, anaerobic endurance and anaerobic power and what he means by those are aerobic capacity, aerobic utilization, anaerobic capacity, and anaerobic utilization." Jan began working with the Dutch rowing team in 2002. Since that time the Dutch have won 6 Olympic medals, 1 gold, 2 silver and 3 bronze. They have also won 24 world championship medals. Rowing is an interesting event in terms of conditioning. It is primarily aerobic, between 80-85% but it requires a strong anaerobic system to win. The training of elite rowers necessitates careful training of the anaerobic system for an optimal performance. Jan Olbrecht has a Ph.D. in Physiology and Bio-Mechanics from Cologne and has swum in three World Championships for Belgium. He is training adviser to several world class athletes and uses a unique method of lactate testing to assess the conditioning of his athletes. Jan believes in careful planning and in altitude training to optimize the athlete's conditioning and performance. He advises athletes whose races last from 20 seconds in swimming to over 8 hours in the Ironman. Dr. Olbrecht's primary method of testing and the basis for his information are lactate tests. While many sports physiologists will use lactate results to plan training he goes a giant step further and uses these results in a very unique way. Dr. Olbrecht discovers what it is in the athlete that produces these results. He will tell you what is in the black box that produced a certain lactate result. To do this he uses a computer simulation program validated with over 1000 athletes. While all this sounds very academic and theoretical, Dr. Olbrecht has produced results in the market place of sports. He has worked for several years with Luc Van Lierde, holder of the Ironman World Championship record (Hawaii 1996) as well as holder of the fastest Ironman ever ran (Ironman Europe 1997) winner again in 1999 of the Ironman World Championship. While his work with Luc Van Lierde is impressive, Jan has also worked with several world class swimmers in Belgium and Holland. In the World Swimming Championships in Perth in January 1998 five swimmers in the finals including three medal winners were under the testing program of Dr. Olbrecht. Brigitte Becue from the Belgian team and Marcel Wouda, Pieter van den Hoogenband, Kerstin Vlieghuis and Inge de Bruijn from Holland all made the finals in Perth. Wouda won a gold medal and a silver medal while van den Hoogenband and Vlieghuis won bronze medals. The Dutch swimmers are coached by Jacco Verhaeren, coach of PSV Eindhoven. In 1999 the success continued. Inge de Bruijn won the 50 free at the 1999 World Short Course Championships in Hong Kong. Wouda, Mark Veens and van den Hoogenband also won medals at Hong Kong and the Dutch men won the 400 free relay and placed second in the 800 m relay there. Brigitte Becue and Kerstin Vlieghuis were also finalist at Hong Kong. In the 1999 European swimming championships Pieter van den Hoogenband probably had the greatest competitive swimming performance since Mark Spitz in 1972. Pieter won six gold medals and swam the two fastest freestyle relay splits in history. Two of his times in individual events were the fastest in the world in 1999 (50 m butterfly and 100 m freestyle.) One other time was second in the world (50 m freestyle) and the other was fourth in the world (200 m freestyle.) Inge de Bruijn was ranked first in the world in 1999 in the 50 m freestyle (European record) and second in the world in the 100 m freestyle, 50 m butterfly and 100 m butterfly (European record). The Dutch men set the European record for the 400 m freestyle. In 2000 Inge de Bruijn broke world records over 10 times in the free and butterfly. In 1999 Luc van Lierde was named "Sportsman of the Year" in Belgium, Pieter van den Hoogenband was named "Sportsman of the Year" in Holland, the Dutch men's 400 m relay team was named "Team of the year" and Inge de Bruijn finished in second place for "Sportswoman of the Year" in Holland. In the 2000 Sydney Olympics van den Hoogenband won 2 gold medals, swam the fastest 200 m relay split in history and set world records as he beat Ian Thorpe of Australia in the 200m freestyle and Alexander Popov in the 100 m freestyle. In the 100 m freestyle he became the only man to ever swim the 100 m free faster than 48 seconds (47.8). The Dutch also won 2 relay medals in the Olympics, the first ever as the Dutch women won the silver in the 400 m free relay and the men won the bronze in the 800 m free relay. In the 2004 Athens Olympics van den Hoogenband won 3 medals, gold in the 100 m freestyle, silver in the 200 m freestyle and silver in the 4 x 100 free relay as the Dutch beat the US team and finished second behind the South Africans who won the gold medal. The Dutch women also won a bronze medal in the 4 x 100 free relay. Dr. Olbrecht also works with other world class athletes. He has worked with Lieve Slegers who has placed third in the New York marathon and Kathleen Smet, 4th at the Athens Olympics, 1998 World University Games champion, 2000 European champion in the triathlon and 15th in the 2000 Sydney Olympics and 5th at the 2001 World Championship. Jan also works with world champion motocross racer, Joel Smets. In rowing Jan works with the Dutch team as both the men's and women's 8's won medals. The Dutch men's 8 won the silver medal and the Dutch women's 8 won the bronze medal in Athens and additional medals in Beijing. In all events athletes which Jan advises won 28 medals in Athens and had two 4th place finishes. In the 2008 and 2012 Olympics and the period in between swimmers Jan has advised set world and Olympic records. In 2013 another athlete advised by Jan, Frederik van Lierde, won the Ironman World Championship at Kona. Last update March 26, 2017 All contents © Sports Resource Group, Inc.